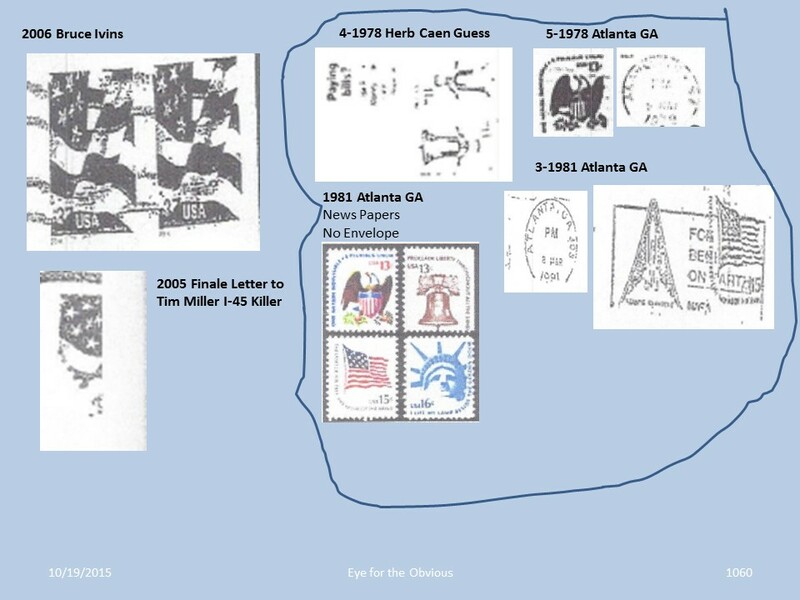 Not only does the stamps match between the Anthrax and Tim Miller I-45 Killings, but another match in the book of stamps is found between the Herb Caen letter in 1978 and letters from the Atlanta GA Killer between 1978 - 1981. Look for yourself by identifying each stamp in the color book from that era. Hi Nanette, great workmanship on your recent postings. Kinda looks like Zodiac Jack is dropping a hint of a federal government connection with these types of postage stamps. He claims he is going for government work in the Fairfield letters which is just before the NY murders begin in 1970's. Yes the stamps are huge clues that has many facets I have put together. It will all be up soon for everyone to see. Has yielded the names - Martin Luther King, Brian Hartnell, and Bowers I am told. But that it is still in the works of a complete solve. There is a 3rd name of involvement, but we will wait to see what the ending result is. The idiosyncrasy of this message is that it names those somehow involved in MLK's death. I have no background on MLK, but today in reading that his family successfully sued and won a wrongful death case in civil court against Lloyd "Jowers" who admitted to receiving $100,000 to arrange MLK's death really shocked me. That means that "Bowers" is most likely "Jowers" with a-typical spelling error by the Zodiac. Nonetheless, the message is ringing true... A killer, killing black children, but requesting a stop be put to "forced bussing" never made any sense that it was a black suspect as law enforcement would like us to believe. It does make sense however, if you are white working for the same ring of people responsible, and you want them to know that you know enough to not be dispensable. I.e., that you have left information bombs all over the US should anything happen to you. To get this big of a message out, one would have to accomplish a large crime that made headline news. I.e., the insert notification that this message was written on, naming 13 newspapers. I cannot wait to see where this goes. TerryB, it seems there is a play on letters that has been going on for quite sometime. This is being revealed in many of the messages coming out, and gives credibility to your S.B.T.C. solve in the Jon Benet Ramsey ransom letter.